The experienced David Hill, who started his career in India under the tutelage of his father in 1969, was fully Licensed in 1973. During his 14 years as a licensed trainer in India he was Champion Trainer in Madras (Chennai), Bangalore, Mysore, Hyderabad and Ootacamund. He trained over 1200 winners during this time. After leaving India, He was licensed by the Hong Kong Jockey Club, where he trained 377 winners and was crowned joint champion trainer for the 1992/93 racing season. David applied his unique training skills to the legendary RIVER VERDON, who was three times Horse of The Year, winner of the Hong Kong International Invitational Race in 1991 and remains the only Triple Crown winner in Hong Kong. 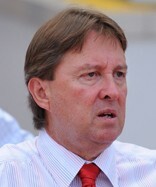 David brought his unique skills and horsemanship to Kranji in 2006, where he dedicates his time to training winners. ONCE UPON A TIME has been more than a fairy tale horse, providing the stable with two feature wins, the 2007 Magic Millions Juvenile Championship and the 2008 Singapore Guineas. David has now taken the small unassuming FLAX to a Group 1 win in 2012 Raffles Cup. From a very early age has been riding and caring for horses. During her High School years she participated in the equestrian program at Oak Hill Academy, becoming an accomplished rider and instructor. Upon arriving in Singapore in 2005 she was an integral part of getting David M. Hill Racing Stables off the ground. In 2010 she successfully completed her National Vocational Qualification for Horse Management at the British School Of Horse Racing in New Market, England. She continues, as stable supervisor and track rider to manage and aid in the training and care of the horses. She hopes to become the next generation in a long line of successful trainers.